As a New Yorker who grew up (+ still lives) near NYC, my recipes are definitely inspired by the things I experience in the big city. Indulgences are a plenty, like one of my favorites the black + white cookie. I used to look forward to sharing a black + white with my mom when I visited the city growing up! Wait, why are you looking at me weird. What's a black + white cookie, you ask? It is a soft, buttery cookie half-dipped in chocolate frosting + vanilla frosting. It's. the. best. But it's also indulgent, so that's why I treat myself to a Zaro's black + white cookies once a month. OK! Maybe twice a month if it's a ridiculously stressful one or I miss my train, which happens quite often. It's definitely become a thing; a little reward for a job well done. So for the lovelies that read my blog, I wanted to re-create the black + white I love, but switch it the eff up. In comes the white cheddar cracker version! Slice + bake crackers are addictive, but they are a good trick to have up your sleeve when you are entertaining during the holidays. I mean, cheese + cheese crackers means I am one happy camper. The key to pulling off the black + white cookie effect is using two types of sesame seeds. Otherwise these are so simple + delicious on their own or with a handful of grapes. Begin by preparing the dough. You'll want to start this ~2 hours to a day before you want to bake them so the dough firms up. 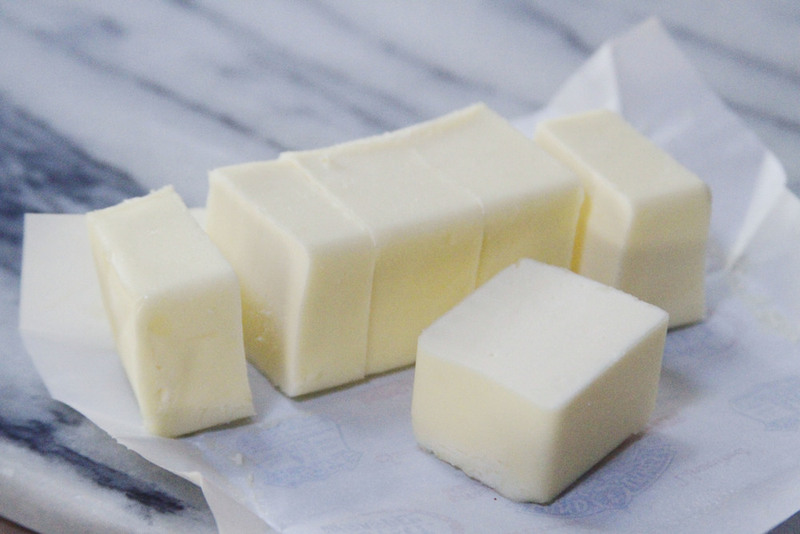 Blend the butter in a mixer until smooth + fluffy. Add the cheddar cheese + continue to combine. Stir together the flour, salt + white pepper in a separate bowl. Add the flour mixture into the mixing bowl until incorporated. Finally add the milk while mixing. You'll want to make sure the dough comes together, not too wet, but not too dry either. Here's the fun part. Tear a large sheet of plastic wrap + lay it out on top of your counter. Scoop the dough on top of the plastic wrap. Shape the dough into a log. Wrap up the dough + place the dough the fridge up to a day to firm up. When you are ready to bake, preheat your oven to 350 degrees. Remove the dough from the oven + slice each of the crackers into thin circular discs. Place each disc on a baking sheet, these won't spread too much but make sure there is enough room between each cracker. Before baking, sprinkle white sesame seeds on one half of the unbaked cracker. Sprinkle black sesame seeds on the other half. YO, you made a black + white cracker but you have to bake them. Bake for 13-15 minutes, until golden. Enjoy these!